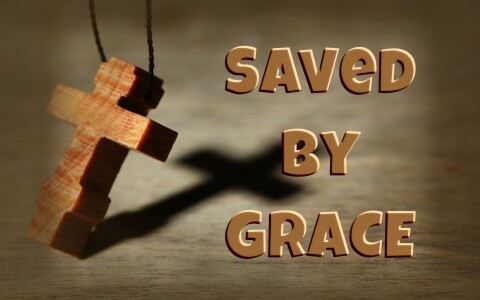 What does it mean to be saved by grace? Is that all there is to it? The old saying that grace is “God’s Riches At Christ’s Expense” is certainly true but it goes so much deeper than that. It is God’s unmerited and undeserved favor in bestowing upon us the gift of grace. Thankfully, it has never depended upon even one work of ours (Eph 2:8-9). That is why grace is so amazing. The Apostle Paul wrote, “Wretched man that I am! Who will deliver me from this body of death” (Rom 7:24) but he didn’t stay there for long; he finished by writing, “Thanks be to God through Jesus Christ our Lord! So then, I myself serve the law of God with my mind, but with my flesh I serve the law of sin” (Rom 7:25). Grace is something we get that we do not deserve, for it was “at the right time Christ died for the ungodly” (Rom 5:6), and thereby “God shows his love for us in that while we were still sinners, Christ died for us”. (Rom5:8). Amazingly, it was “while we were enemies we were reconciled to God by the death of his Son” (Rom 5:10). To die for one’s enemy is fully a work of grace because an enemy didn’t deserve it. A person is saved when they repent of their sins which means they turn away from and forsake them and that often means forsaking our friends who we used to run with. No, we don’t cut them all out of our life but we don’t go where we used to go with them anymore. We’ve turned away from that and turned to Christ and put our trust in Him and as “the Scripture says, “Everyone who believes in him will not be put to shame” (Rom 10:11) and the Apostle Peter, quoting Isaiah 28:16 wrote “Behold, I am laying in Zion a stone, a cornerstone chosen and precious, and whoever believes in him will not be put to shame” (1 Pet 2:6). There is no shame for those who are in Christ and eagerly anticipate His return but for those who pierced Him and all who rejected Him, when they see Him, they “will wail on account of him” (Rev 1:7c) because they know judgment is coming (Rev 20:12-15). The main point is if you add one drop of works to grace, then it’s not grace anymore but works and if it’s works, then that’s not saving grace. It is like an equation; grace + works = eternal life but grace + works = nothing! However, it is important to know that a person that is saved will do works, but that’s because they are saved that they do them. Works are not done in order to be saved BY them, but to be saved FOR them (Eph 2:10). Once a person has trusted in Christ and received the free gift of grace, why not tell others about it? The last I heard was about 75% of people who don’t attend church have never been invited to go to church. That’s our bad. We are often living in the sin of the “great omission” rather than obeying the “Great Commission” (Matt 28:19-20) and so “whoever knows the right thing to do and fails to do it, for him it is sin” (James 4:17) and if that “right thing to do” is to share the gospel. What do you do with the grace of God? You give it away. You share it with others! The supply of God’s grace is infinite. James and the Apostle Peter both wrote “God opposes the proud but gives grace to the humble” (1 Pet 5:5; James 4:6). We must think back to the time when we “were dead in the trespasses and sins” (Eph 2:1) and deserving only the wrath of God and so like Paul, “was made a minister according to the gift of God’s grace” (Eph 3:7) we are ministers of the gospel of Jesus Christ and told to go into all the world, not forgetting to go right next door. Jesus came into the world full of grace and truth (John 1:14) and God seeks those who will worship Him in spirit and in truth (John 4:24) so truth is very important to God and in fact, Jesus is the embodiment of truth, saying “I am the way, and the truth, and the life. No one comes to the Father except through me” (John 14:6). If you’ve got all truth and no grace, you could end up with legalism. If you’ve got all grace and no truth, you’ve got a license to sin. We need both grace and truth and sharing the grace of God is first telling them about the wrath of God. The good news of the grace and mercy of God is not relevant until the wrath of God is revealed to the sinner (John 3:36). It’s like being at the doctor’s office and the receptionist gives you the prescription before you’ve even seen the doctor nor seen your x-rays and blood work tests. Until the doctor comes out and tells you, “Look at these x-rays and look at your test results…you’re going to die if you don’t take this prescription I’m making out for you.” Of course, you’d make haste to the pharmacy to fill it because you don’t want to die and so it is, unless the sinner is made to see their state before a holy God (Rev 21:8), they will never run to the cross for safety. The Pharisees were all about works. They had hundreds of rules and regulations that made it seem impossible to ever be saved by the law and works and that’s true, because no one can be saved by works anyway (Eph 2:8-9). We are saved FOR works but not BY our works. So the Pharisees were like some legalists today. Do this and don’t do that. The Sadducees were just the opposite. They didn’t believe in following a bunch of laws, and they certainly didn’t believe in angels, miracles, or in the resurrection of the dead, so their philosophy was like having a license to sin. We can stay in the middle of the road if we understand that we’re saved only by grace and that’s a free gift from God and it cannot be earned. That explains why John Newton wrote about such amazing grace because it’s just that; amazing!